It was the home of Swiss watchmaker and amateur scientist, Mr Johann Schweppe, who in 1783 developed the first practical process to manufacture bottled carbonated mineral water …. and, in a more cultural vein, the area has had a big influence on English literature. It is because of this that I am here – to celebrate 200 years since the publication of what is often known as the first gothic novel – “Frankenstein”. 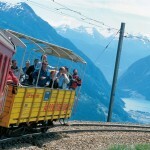 It was conceived by Mary Shelley in Geneva and much of the action takes place in and around here too. The book’s own origins are a story in their own right. Mary Godwin at the age of just 16 had run away with the, already-married -to someone-else, poet, Percy Shelley and they had decided to spend the summer on the Lake, mainly to join Lord Byron who was living there at the time. Although the Shelley party had their own place, they spent a lot of time with Byron in his house “Villa Diadoti” in the stylish suburb of Cologny. It is privately owned nowadays, but I was able to see its green shuttered elegance from a nearby meadow. Their plan went slightly wrong, when the idyllic summer turned into one of incessant rain, as the fallout of the eruption of Mount Tambora, in what is now Indonesia, affected all the European weather patterns. Confined to the house, Byron suggested to his guests they should have a competition as to who could write the most frightening horror story. This was won hands down by the youngest member of the party, Mary, and the dreadful creature at the centre of the book, today has its own life sized statue in in the Plainpalais quarter of Geneva where his first murder was committed. Have your picture taken, if you dare, with his bronze arm outstretched around your waist! It only took a 5 minute cable ride to reach the top of Mout Saleve, 20 km from the centre of town where the book recounts the monster leaping up the crags, here while escaping his crimes. 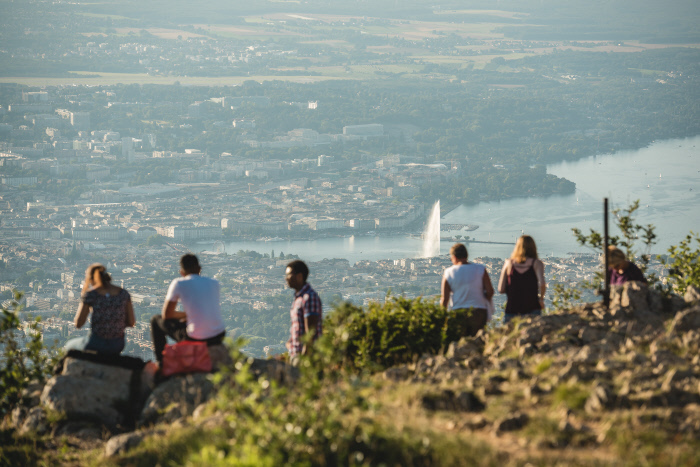 The view from the top is magnificent, taking in both France and Switzerland, and visitors can choose from various walking trails and an excellent restaurant. 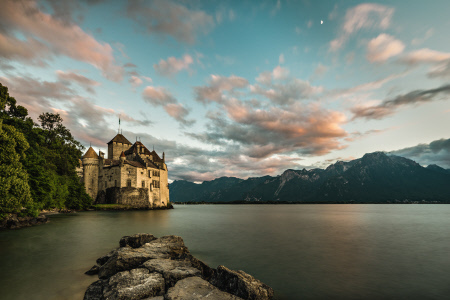 A leisurely boat ride on Lake Geneva takes me to the huge medieval fortress of Chillon which is in a stunning position overlooking the water. It origins are unknown but what is recorded is it was used by the Dukes of Savoy to house prisoners, its most famous being François de Bonivard, a Genevois monk and politician who was locked up in 1530 for defending his homeland. That same summer, when the weather had improved just a little, Byron and Shelley decided to take a boat trip to visit the castle. 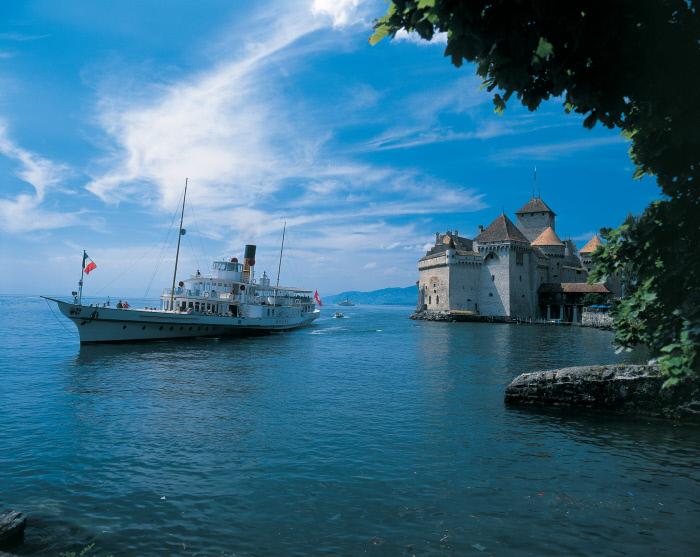 The story of Bonivard made such an impression on Byron that he was inspired to write his poem “The Prisoner of Chillon”. This literary connection has helped to make the fortress the most visited historical building in Switzerland , and my guide was even able to point out Byron’s signature, carved into a pillar. So literature and the tonic for my gin…… Switzerland thank you.